Everyone raved about the Pineapple Salsa at last week’s Southwest Brunch so I decided to make up a recipe. This one is spiced with the special flavor combination that Jamaicans have made famous (allspice/thyme/nutmeg/lime). My favorite way to prepare salsa is in a wood bowl with an ulu to save time by chopping everything together – start by chopping the onions, then add the tomatoes and cilantro and finally the pineapple, lime and spices. Serve as a side dish with Chorizo Migas. 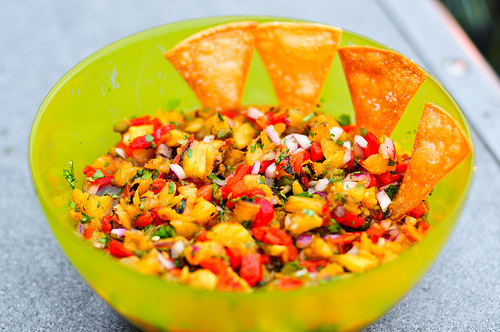 There are many ways to prepare Pineapple Salsa. The version pictured above uses grilled pineapple! And we all know grilling season is not too far off! For a fiber rich Pineapple salsa try a recipe adding black beans and corn kernels to the mix.